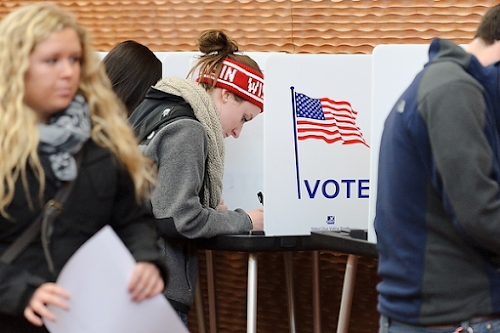 Three things college students need to do to vote in Wisconsin. Make sure you have an acceptable photo ID for voting. If you already have a Wisconsin driver license or one of the other acceptable forms of photo ID for voting pictured below, then you’re all set, go to Number Two! If you do not have one of the photo IDs pictured left (click to enlarge image), look up your school NOW on the appropriate list linked below to see if your current student ID is an acceptable form of ID for voting. 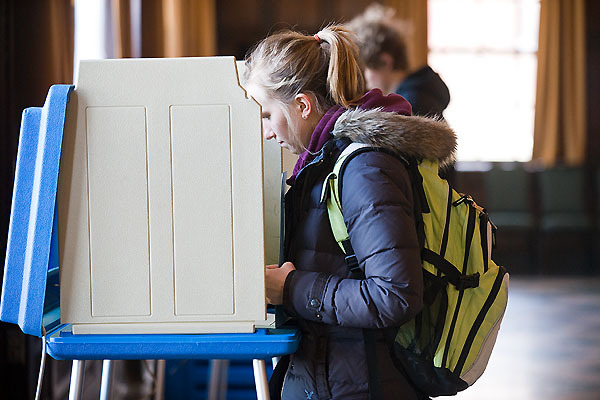 The standard student ID at only three of the University of Wisconsin’s 13 four-year schools and at seven of the state’s 23 private colleges can be used as a voter photo ID. So, if you don’t have a WI driver license or one of the other acceptable IDs, know your options and look up your school today! Note: if you use a school-issued ID for voting, you must also present (or display electronically) at the polls a separate proof of enrollment document, such as an enrollment verification form, class schedule or tuition bill. 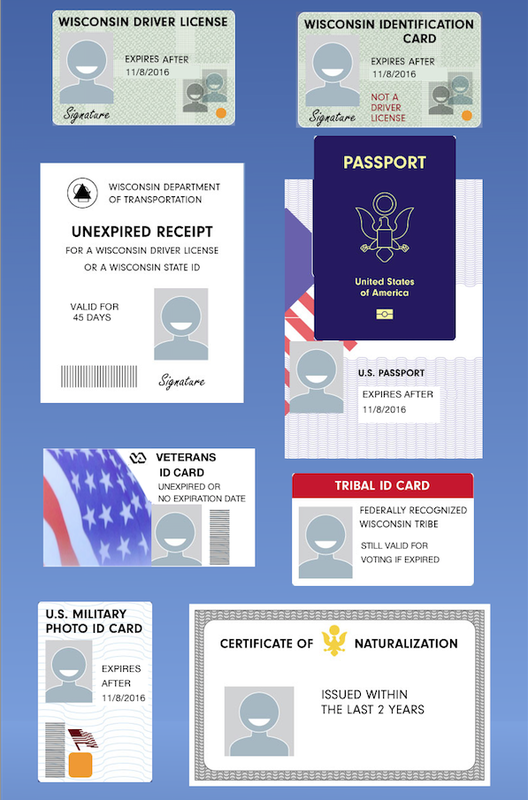 For more information on Wisconsin’s voter photo ID requirement, visit: Bring It to the Ballot. Make sure you’re registered to vote at the right place. Even if you think you’re already registered at your current address, confirm it! You now only need to have lived at your current address for at least 10 days by Election Day in order to register to vote in that election district or ward. By Mail. 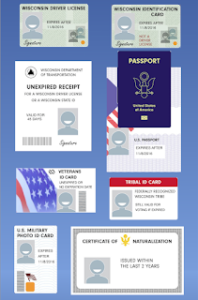 You can start your voter registration form online at MyVote.WI.gov – then print, sign and mail it to your municipal clerk along with a proof of residence (POR) document. Your form and POR must be received no later than 20 days before the election in which you are planning to vote. In your Municipal Clerk’s Office. You can register in-person in your municipal clerk’s office up until the 5pm (or close of business) on the Friday before the election in which you are planning to vote. You’ll need to bring a proof of residence document to complete your registration (this document can be shown electronically). At the Polls on Election Day. 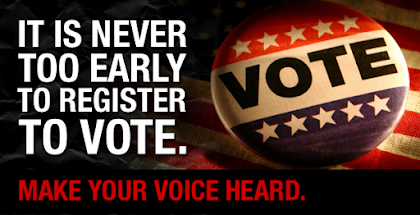 If you’re unable to register by any of the methods above, you can still register when you go to the polls to vote. You will need to present a proof of residence document when registering (again, this document can be shown electronically). And don’t forget to bring your photo ID! To preserve and protect our democracy, we have to show up. Share the link to this page on Facebook, Twitter, online forums – anywhere and any way you think helpful. Email it to your friends – and encourage others to share this page as well. Voting is a right none of us can afford to lose.